This morning my 2-year-old and I climbed into the car to zoom across town to Billy Hyde Music in Blackburn to pick up my latest toy, a JLH AxeTrak. I bought the AxeTrak after reading about it on Harmony Central and posting about it here on my blog. The AxeTrak is a speaker and microphone inside a soundproofed box, and with it I’ll finally be able to record my Marshall DSL50 amp in a controlled environment – which means I’ll now be able to record audio and video reviews of various products for I Heart Guitar. I’ve already planned the first few pedal reviews, which will be the Roger Mayer Spitfire X and Mongoose X, and the MXR EVH Phase 90. It might take me a couple of weeks to post them while I mess around with video editing programs (used to edit video for a living but I’m a bit out of practice now) and try to figure out the best way to do it. But at the very least I should have audio samples of the Roger Mayer pedals finished some time this week. I’ve been doing a lot of home recording lately, but with an adorable 2-year-old running around, time and space are scarce, so I’ve been using IK Multimedia’s Amplitube 2 amp simulator into Pro Tools. I’m pretty happy with Amplitube (especially after taming its strange midrange spike using IK’s T-Racks, which seems to reduce the effect much better than using Amplitube’s internal parametric EQ), but there are times when I really wish I could just crank up my Marshall DSL50 and record the demonically loud results. I’ve Googled a few products that could help me achieve this, but so far the coolest has got to be the AxeTrak 112 by JLH Products, which was released in February. The idea’s pretty simple: there’s a mic’d 6” speaker inside a soundproofed cabinet for silent recording (or for a perfectly isolated amp sound for live performance), as well as an external 12” speaker which you can choose turn on for monitoring. There’s also a version called the AxeTrak 312 with 3 external speakers to give the best of both worlds. 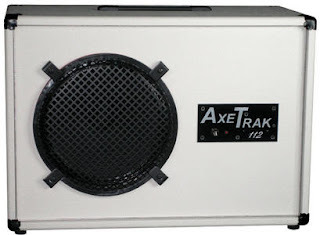 JLH Products introduces the newest addition to their AxeTrak lineup of isolation / recording cabinets for electric guitar, the “AxeTrak 112”. This cabinet is handmade in the USA the old fashioned way, one unit at a time. The AxeTrak 112 has many features that set it apart from other speaker cabinets and isolation cabinets on the market today. It is loaded with one 12″ Eminence Governor speaker, and also has a self-contained AxeTrak isolation cabinet mounted inside its ivory covered Baltic birch enclosure. The main feature that sets this cabinet apart from other speaker cabinets and isolation cabinets is the fact that it can operate in either of two modes. If you are playing a gig and you want stage monitoring just push the button on the rear of the cabinet and your sound will be fed to the 12″ speaker in addition to the internal isolation cabinet. This mode will still provide the sound engineer or recording engineer with a direct isolated feed of your mic’d sound. If you press the button again you will be in silent mode. In silent mode the sound is fed only to the internal isolation cabinet and your stage volume will be non-existent. The sound engineer or recording engineer will still have an isolated, direct feed of your mic’d sound. The AxeTrak 112 features a dual input impedance toggle switch that allows the cabinet to be switched between 4 ohms and 16 ohms. It can handle 100-watts. 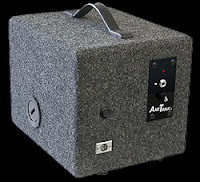 The self-contained internal isolation cabinet has a 6″ high-power AxeTrak driver and custom cardioid dynamic microphone cartridge. For more information and a detailed description of this product please visit the Axe Trak website or call 949-859-7293.